Following the successful debut of Garrison Imperial I.P.A. as part of the LCBO’s Autumn Ales release (all that’s left is what’s listed in the current inventory), The Bar Towel is happy to announce an exclusive private order for beer connoisseurs who would like some more Garrison. 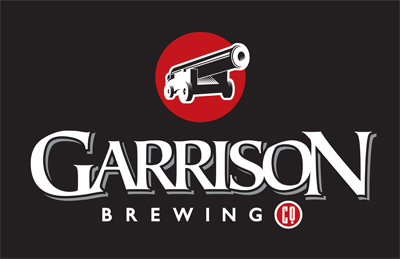 This private order allows you to order full cases of just about the full lineup of Garrison beers: Imperial I.P.A., Tall Ship Amber, Irish Red (2010 CBA Winner), Nut Brown Ale, Hopyard Pale Ale (2010 CBA Winner), Raspberry Wheat, Blackberry Wheat, Jalapeno Ale, Martello Stout, Black I.P.A. (2010 CBA Winner), Winter Warmer, Grand Baltic Porter (2010 CBA Winner) and Ol’ Fog Burner Barley Wine. There are also two special mix packs available: the Brewmaster’s Mix, which features two bottles of Martello Stout, Imperial I.P.A., Black I.P.A., Winter Warmer, Grand Baltic Porter and Ol’ Fog Burner Barley Wine and the Mix 6, with four each of Tall Ship, Irish Red, Nut Brown, Hopyard Pale, Raspberry Wheat and Martello Stout. The Brewmaster’s Mix also comes with a special collectible Garrison bottle opener. This private order will not be open long so order now if you are interested. You must purchase by the full case. Full details of the private ordering process is listed on the ordering page. 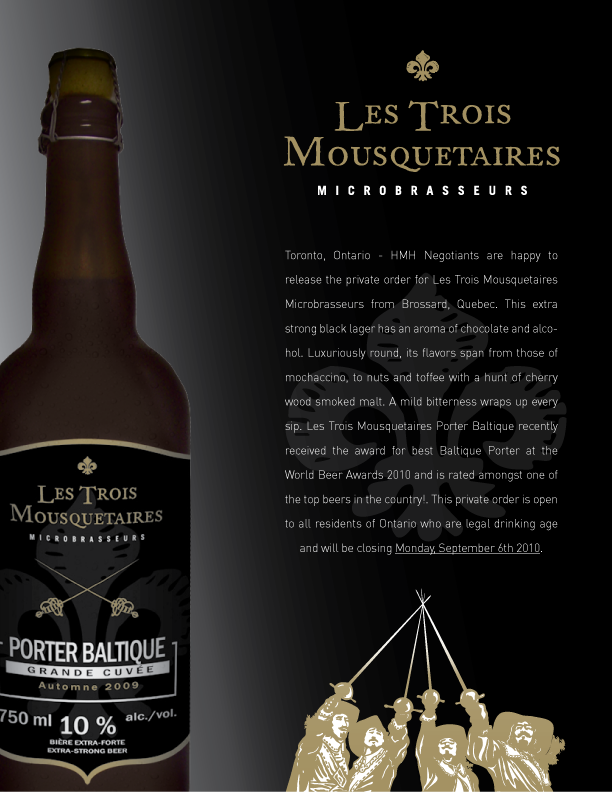 HMH Negotiants are happy to release the private order for Grande Cuvée Porter Baltique 2010 from Les Trois Mousquetaires Microbrasseurs of Brossard, Quebec. This extra strong black lager has an aroma of chocolate and alcohol. Luxuriously round, its flavors span from those of mochaccino, to nuts and toffee with a hunt of cherry wood smoked malt. A mild bitterness wraps up every sip. Les Trois Mousquetaires Porter Baltique recently received the award for best Baltic Porter at the World Beer Awards 2010 and is rated amongst one of the top beers in the country! This private order is open to all residents of Ontario and will be closing Monday, September 6th 2010. Baltic Porter (10.0%) 12x 750mL – Extra Strong Beer – $95.00 per case. If you are interested in placing an order, please e-mail sales@hmhnegotiants.com the following information; your name, address, phone number, e-mail address and the number of cases you would like to order. Cheers! 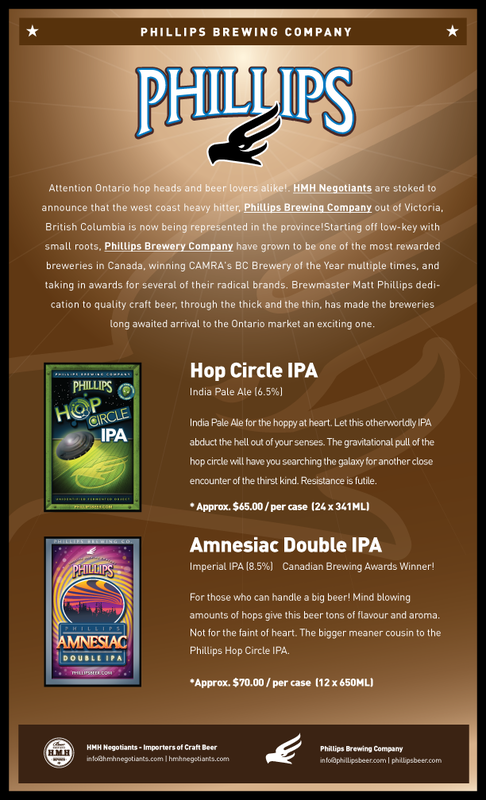 Phillips Brewing Co. Invades Ontario! Two Beers Now Available for Private Order! another close encounter of the thirst kind. Resistance is futile. The Bar Towel, through its partner corporation Cecktor Limited, is happy to announce that it has been appointed the Ontario representative for Picaroons Traditional Ales of Fredericton, New Brunswick. Picaroons, brewed by the Northampton Brewing Company, is the second brewery partner of The Bar Towel Specialty Beer Imports / Cecktor Limited, an affiliate of The Bar Towel dedicated to offering unique products to Ontario beer lovers. This relationship with Picaroons also strengthens the Free Our Beer initiative, an offshoot of The Bar Towel dedicated to reforming Ontario’s beer retailing system. 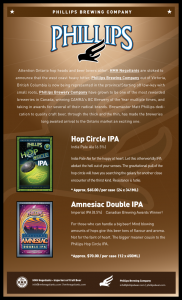 At the same time we are also happy to launch a Private Order for Picaroons for Ontario consumers. Effective immediately, Ontario consumers can order full cases of Picaroons Best Bitter Ale, Man’s Best Friend Porter, Timber Hog Stout, Yippee IPA and Feel’s Good Pilsner. You can find out more about this order and place your order securely online here. Central City Brewing Co. and HMH Negotiants, are excited to announce the release of Central City Red Racer IPA for private order in Ontario! Central City, out of Surrey BC, have become known for their true to taste styles, funky labels, and use of cans. With their growing popularity, and great taste, it’s no wonder why Central City is a top rated Canadian Brewery, and why beer lovers, and patio drinkers alike would love to have this aggressively hopped IPA in their fridge. This award winning IPA, is an ale that was fashioned to survive the long voyage from England to India during the British colonization. 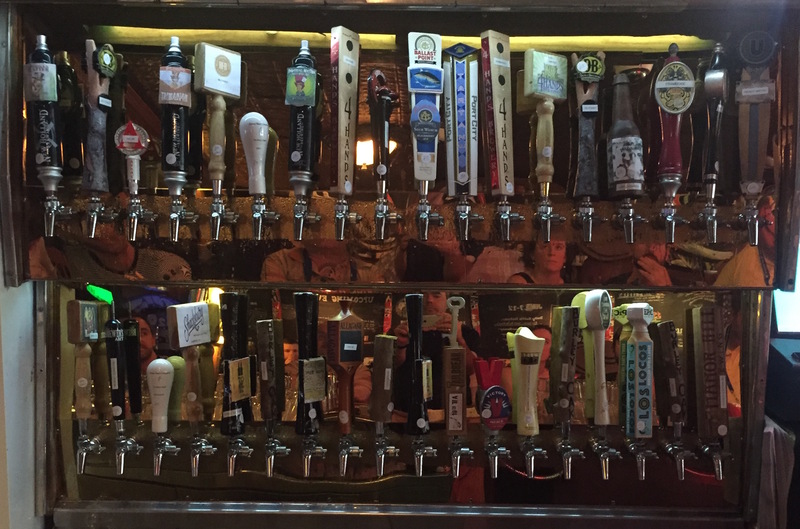 Hops, hops, and more hops, this ale has an intense aroma and a long lingering finish. Drink as an appetizer on its own, or pair it with a hearty dish. A beer for the connoisseur, this is a brew not to be missed. If you are interested in placing an order, please e-mail your name, phone number, address, email and the quantity you are interested in ordering to sales@hmhnegotiants.com. This order will be closing Wednesday, May 12th, 2010. For more information on how private ordering works, please visit www.hmhnegotiants.com/aboutprivateordering.html. 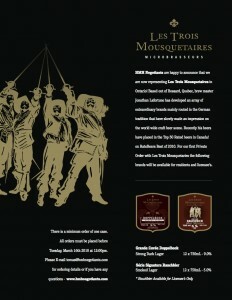 HMH Negotiants and Microbrasserie Dieu Du Ciel! 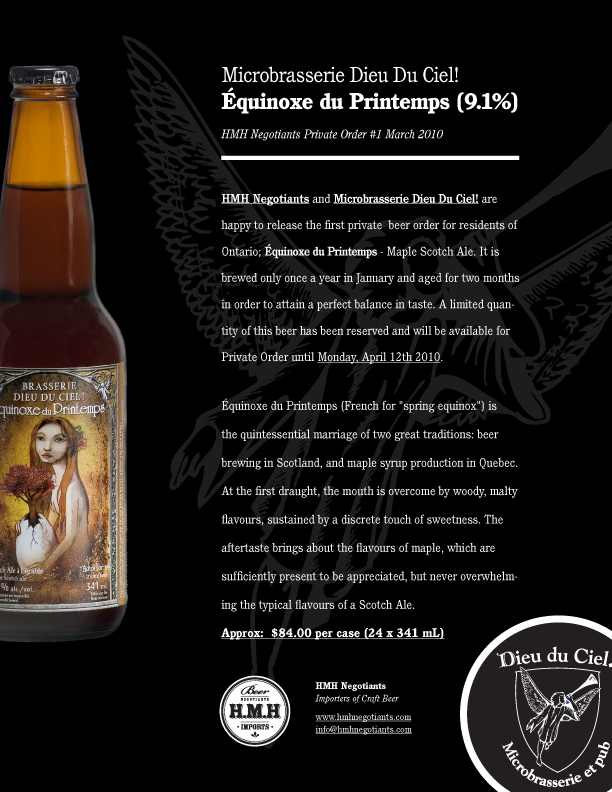 are happy to release the first private beer order for residents of Ontario; Équinoxe du Printemps – Maple Scotch Ale. It is brewed only once a year in January and aged for two months in order to attain a perfect balance in taste. A limited quantity of this beer has been reserved and will be available for Private Order until Monday, April 12th 2010. Équinoxe du Printemps (French for “spring equinox”) is the quintessential marriage of two great traditions: beer brewing in Scotland, and maple syrup production in Quebec. At the first draught, the mouth is overcome by woody, malty flavours, sustained by a discrete touch of sweetness. The aftertaste brings about the flavours of maple, which are sufficiently present to be appreciated, but never overwhelming the typical flavours of a Scotch Ale. Approx: $84.00 per case (24 x 341 mL). If you are interested in placing an order; please e-mail tomas@hmhnegotiants.com the following information; your full name, address, telephone number, e-mail address and the number of cases you would like to order. Cheers! This order will be closing on Monday, March 16th, 2010 at 12:00pm. If you would like to order this brand, please e-mail tomas@hmhnegotiants.com the following information; your full name, mailing address including postal code and city, telephone number, e-mail address and the number of cases you would like to order. If you have any questions or concerns please feel free to e-mail us. Cheers! Wine import agency Stem Wine Group have announced the addition of Italian artisanal brewery Birrificio Brùton to their product portfolio. Brùton is based in Maremma (southwest Tuscany), and is owned by the son of a well known winemaker from the region. Stem have three Brùton beers available via private order: Brùton di Brùton, Brùton Lilith and Brùton Stoner. Each sell for $15.99 per 750 ml bottle, available in cases of 6 bottles. To place an order or for more information, contact Stem Wine Group.